Crazy Mama! 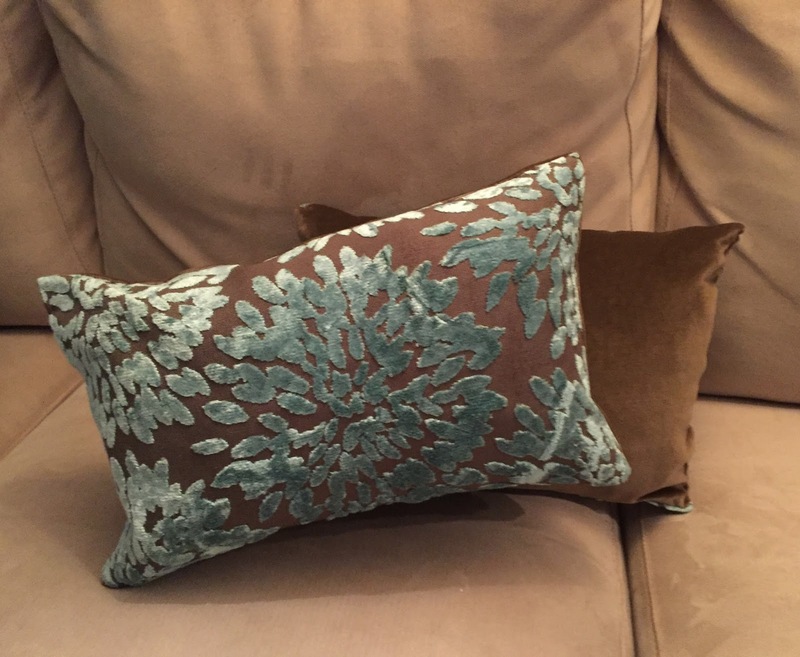 : My GORGEOUS "Almost-No-Sew" $2 Throw Pillows! My GORGEOUS "Almost-No-Sew" $2 Throw Pillows! After restoring the piano bench, I had some surplus fabric....but it is SO beautiful, I HAD to use ALL of it! I also happen to have 2 throw pillows that needed covers. PERFECT! But...I only had enough fabric to cover 1 throw pillow, front and back, OR 2 throw pillows, front only. So I went with the latter. Now I need fabric for the backs. So, I went to my local fabric store, and sifted through their disorganized scrap bins. After 90 minutes...in the bottom of the very last scrap bin, I found it! 2 scraps of the perfect size, perfect color and perfect texture fabric! $1 each. Woot woot! I intended on sewing them...I even borrowed a sewing machine...but the needle was broken and it was missing parts. SO...I did some digging online and learned about "HEAT N BOND Ultra" - a miracle no-sew product!!!! I had a 50% coupon at Michaels, so it only cost $ 1.79 for 10 yards of 3/8" bonding tape. All you need is an iron, and a few seconds! It was AMAZING! I was able to successfully bond 3 sides of each pillow...but after inserting the pillow, I couldn't bond the open ends...so I sewed them by hand, but that went pretty fast, and looks good. FYI: I thought I was clever and initially tried to use a hair iron, but it didn't work as well as a real iron...I strongly recommend a real iron and follow the instructions. Here is the final product - I LOVE IT!!! I LOVE my new pillows! My 2 finished pillows! LOVE! My name is Deb. I am Interior Designer, Art Director, Production Designer and Film/Tv Producer. I juggle all my roles while being mom to an amazing little girl! And while she is amazing, she can be a very picky eater! So I started shaping her food into fun characters…and all my friends started calling me CRAZY! Haha! So what better name than Crazy Mama? I have since found some truly AMAZING food artists online…and I am so impressed with their work! I don't shop for ingredients to make Food Art…I simply use whatever organic ingredients I have in my pantry…which is often limiting. Sometimes the designs turn out really great, other times…not so much! But I have fun with my little cutie in the process! I hope you enjoy seeing them! And if you have a request- send it in!! !